Iris Chacon was raised on the beaches and farmlands of sunny Florida, and her books are full of the joy and warmth one expects from the Sunshine State. Readers love her original, lovable, surprising characters and humorous down-home dialogue. In Iris's books there is always a mystery, an unusual or unlikely romance, and lots to laugh about. If you like wholesome entertainment (with no prurient content to sully your reading fun), you will love Iris Chacon's clean, lively, family-friendly stories. From the shy carpenter who wants to adopt six kids, to the grouchy cowboy forced to take in the boss's daughter, to the spinster doctor trying to raise an amnesiac secret agent who now thinks like a preschooler, the characters who populate Iris's books will win your heart and haunt your memories. Enjoy a Florida vacation without leaving home, by curling up with Finding Miranda or one of the other sunny Iris Chacon novels. Meet Miranda Ogilvy, a librarian who is like a ghost: she is invisible, except there is a blind man who sees her and a hired henchman out to kill her. When her aunt suddenly dies, leaving Miranda an old cottage in Minokee, she leaves Miami. But this doesn’t resolve the problem as people still don’t notice her. Only a handsome neighbor and the man who murdered her aunt seem to be aware of her. The reader is pulled into a tale of intrigue, mystery, and corruption, and a strange woman’s life on the line. But can Shepard Krausse and Dave protect her from those determined to take her down? 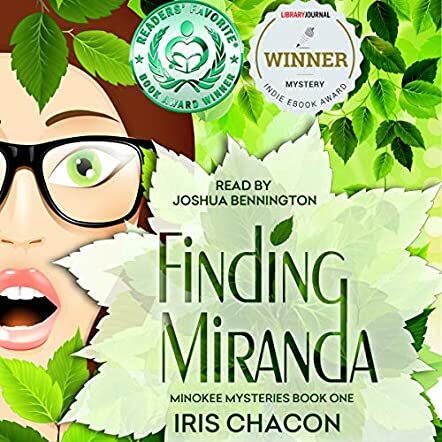 Finding Miranda by Iris Chacon is a gripping treat for fans of the paranormal, narrated in an absorbing and clear voice by Joshua Bennington — and I enjoyed the drama and the pacing, well captured in the narrative tone. The narrator speaks as though they are actually in the story, allowing the suspense to come out clearly, together with the tone and the strong voice. I enjoyed the strong setting, the plot lines and the sense of mystery that permeates the entire narrative. Readers will want to know what happens to Miranda from the moment they meet her. It’s hard to say from the start if she is cursed or if she possesses a unique skill that makes her live like a ghost, but whatever happens, readers are compelled to listen to the story to find out why she is the way she is and what might happen to her. Finding Miranda by Iris Chacon is an intriguing narrative, a beautiful story beautifully told. The prose is excellent, the pacing fast, and the character development stellar. It’s a very engaging story that will keep you awake through the night.